To open your account we need a few details about you. We ask for this information to enable us to operate and manage your account. If you want to open a Pro account, start by opening a Basic account here - you'll then be given instructions on how to upgrade to Pro. This is the name you'll use to login to SquawkBox. Make sure it's at least 6 characters long. Passwords are case-sensitive and should be at least 6 characters long. Do you agree to the SquawkBox Terms & Conditions? Do you opt-in to the SquawkBox announcements mailing list? This is a low-volume mailing list which we use to keep you informed about your account, new SquawkBox features and other news. 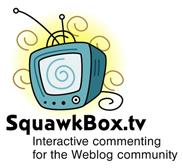 Do you opt-in to the SquawkBox general mailing list? This is a low-volume mailing list which we use to keep you informed about general items of interest to SquawkBoxers.